The High Priestess is loving, but somewhat aloof. Silence, reflection and occult wisdom are her specialties. She’s not one for horseplay, preferring quiet meditation and serious study. But she’s sensitive, not shy. When the need arises, she has no problem communicating how she feels. Her intelligence comes from listening, paying attention to all around her. No one vision is sacred, but having one is. Without the spirit, life for her would be empty. Strength is interested in the spirit as well. It’s what drives her, and she’s not afraid for the world to know. Strength is bold yet innocent, almost instinctual in her ways. She’s powered by the sun and is adept at controlling its awesome energy. She has no need for sunscreen, or padding against the lion. They act as one. Flowers and white cotton are all the protection she needs. The High Priestess is out of her element here, but it’s certainly not the worst place for her to be. She appreciates Strength’s soul, if not always her way of expressing it. The Moon in Leo, or High Priestess in Strength’s clothing is potentially a time of emotional power. Something beautiful that’s usually under-wraps can finally be revealed. 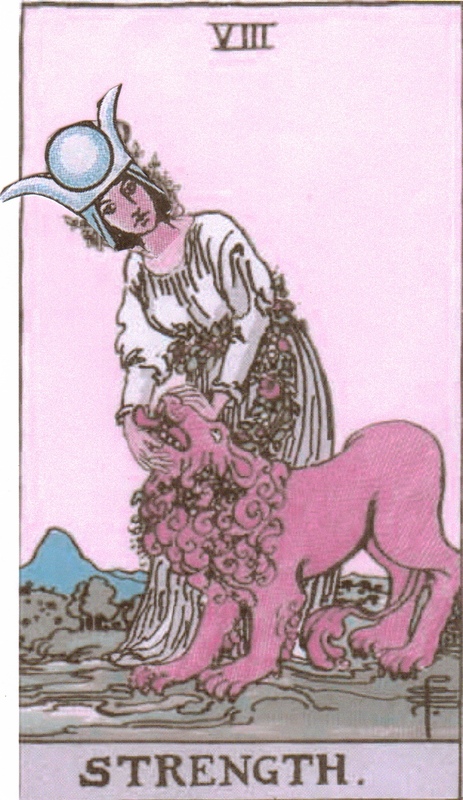 § 3 Responses to Moon in Leo – High Priestess in Strength’s Clothing"
I agree! this is a great interpretation. I love it. That was a gorgeously worded interpretation of the Moon in Leo!